Taking premium, hand-selected beans cultivated on the Bourbon Island of Madagascar, we use our proprietary cold extraction process to gently draw out and preserve the vanilla's over 300 flavor compounds. The result is a sweet, creamy, mellow flavor with velvety after-tones, perfect for cooking and baking both sweet and savory dishes. An exceptional "all-purpose" vanilla. Available in quarts (6 to a case) and gallons (4 to a case). This product is Kosher and Gluten-Free Certified as well as All-Natural, Allergen-Free and GMO-Free. 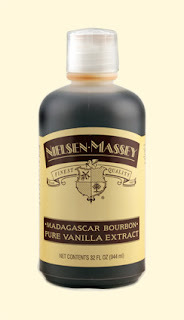 Nielsen-Massey Madagascar Bourbon Pure Vanilla Extract is wonderful! This vanilla gives off such an gourmet vanilla flavor! I love the flavor it gives to all my recipes that require vanilla and because of Nielsen-Massey Madagascar Bourbon Pure Vanilla Extract I always get comments about how wonderful my desserts taste. People always mention that my recipes have a unique but delicious flavor and I believe this to be because of the Nielsen-Massey Madagascar Bourbon Pure Vanilla Extract. Once you try it you won't be able to use any other brand! Click HERE to find a distributor near you! Follow Nielsen-Massey on social media! I love adding a touch of vanilla to pancakes and my coffee in the morning. This would be great in cookies too! Using real quality vanilla is so important! It makes such a difference in the quality of the recipe! Sounds delicious! I didn't realize how important a quality vanilla was until I tried one. It makes an enormous difference! Sounds delicious! Vanilla is probably my favorite ingredient! I've heard good things about Nielsen-Massey Vanillas, but haven't tried them yet. A really good vanilla can make or break a recipe! I'm always looking for a good quality vanilla extract to use in my baking, I might have to try this kind out! I don't know if I've ever had vanilla extract with bourbon before, but I bet it is AMAZING in rum cake! I've never had this type of vanilla extract and it sounds amazing. My husband would go crazy over this! Thanks for the suggestion!